Luton Airport is in an invidious situation. Passengers are voting with their seats that they want to use the airport with numbers up 18.5% in 2016 to 14.5m and an astonishing 24.6% growth in December compared with the same month in 2015. Low-cost airlines are keen to come in with Wizz announcing the airport as its first base only last week (see BTN 20 February). At the same time Luton is sitting at the bottom of the league of British airports when it comes to passenger satisfaction according to Which Magazine (see below). Road access has improved significantly in the last 12 months with the roundabout at the M1 junction from the south no longer a leap into the unknown (traffic for the airport from the north trying to access the same piece of road) and it is now a smooth run until the Holiday Inn roundabout about a quarter mile south of the terminal. Finally being constructed, the dual carriageway under the runway to the drop off area was supposed to be completed last October but looks unlikely to be ready for the Easter rush. Last week drivers attempting to get to the easyJet headquarters and other buildings in the terminal area, or even view the work when passing through, were confronted with a £3 charge. 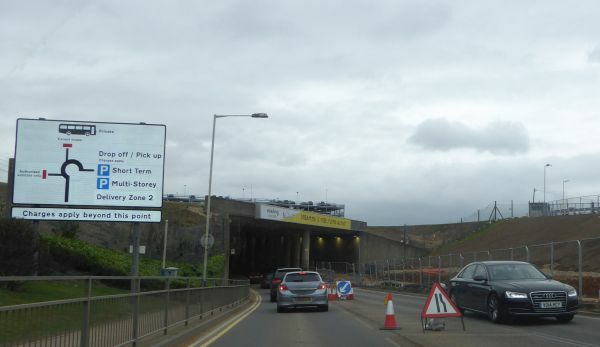 Is this to remain or is Luton Airport to become a toll road? For the future the plans for Luton Airport look fine with a £200m investment by the local borough council for a rail link to Luton Parkway station confirmed last week (see BTN 20 February) and the rebuilding of the terminal well under way. There is strenuous lobbying to increase the frequency of the fast (24min) train service to St Pancras. However all is not good news. BTN does have some serious reservations which can be dealt with at this stage but it does mean that the airport operator, Spanish owners Aena and Ardian will have to dig that little bit more into its pockets. Perhaps they are not used to the British weather! Arriving and departing from the airport can be a very arduous affair due to mother nature. No air-bridges is part of the low-cost philosophy which we have to live with but that is only for a short period whilst boarding and arriving on an aircraft. As things stand the drop-off area is completely open to the elements. Maybe ‘health and safety’ ought to look into things? Standing in the open at a bus stop is not much fun. The new multi-storey car park might look fine but there are no mechanised walkways such as at Gatwick and Heathrow, and it is a fair distance with a need to drop down to ground level and join the throng. And out into the elements. London Luton Airport Operations Ltd, with its long lease from the borough council, needs to rethink its passenger needs. Cover them up please. A new sign has just been added. Luton Airport now appears to be a toll road. The one positive I have found the last two times I flew in (I was probably lucky/) was the e-passport gates - I went pretty much straight through both times. But charging £3 for the privilege of dropping someone off is shocking. Historically the airport has always been playing catch up with passenger numbers and expectations, and along the route has made many mistakes. Unfortunately they continue to make these mistakes with the development of the original old terminal building. The central core of this building dates back to 1968, it has 5 different roof lines and leaks like a sieve. It is not fit for purpose or redevelopment and should have been demolished along with Hangar 89 (current Easyjet headquarters building) to provide a purpose built new terminal facility fit for the future. The problem lies with Luton Council and the concession. Luton is an embarrassing abomination and sadly, it has been entrusted not to a UK owner that might actually be concerned enough about the country's reputation to correct the problems, but to a non-British owner. Time for them to Brexit maybe? The security hall is one of the worst parts. Whilst passengers get through this thunderous cacophony relatively quickly, I have great empathy for the employees whose health and safety is daily assaulted by the outlet/warehouse store style room with no sound proofing anywhere in sight, but utilities everywhere in sight. What an eyesore! What an earsore! Whilst the current planned development is welcome there remain fundamental problems. The biggest of these is the financial model where the operating company leases the right to operate from Luton Borough Council (LBC). The concession runs until March 2031 which leaves only 14 years to see any returns on your investment. With that constraint in mind the operating company is only investing £110m over 5 years. This development supposedly includes terminal, road access, car parking, additional aircraft stands, and full parallel taxiway. An impossible figure when compared to the more realistic development programmes announced by London City and Stansted at £344m and £600m respectively. Agree - standing in the open isn't good. What's worse is having to queue on a staircase, with other people with their cabin baggage - to me that's unsafe. Luton is a very convenient airport and offers a good range of flights. However, the apparent distain with which they treat passengers is unbelievable. Pay to use the access road, drop off and trolleys. No weather cover so standing in the rain, it all leaves everything to be desired. Though I like the airport I will do everything I can to avoid using it. Passengers will only put up with such treatment for so long. Luton seem to forget that there are 5 or more airports competing for their business. It won’t be long before their traffic numbers reflect their poor customer service.